Professor Julian Birkinshaw also encourages managers of traditional organizations to give so-called adhocracy a try. “Give a team a challenging task, set a timetable, and liberate them from any structure and routine”, he suggests. “The new world order in business” is written on a slide displayed by Professor Julian Birkinshaw to Aalto Executive MBA and Aalto MBA participants gathered to listen to his lecture in Otaniemi, Espoo. 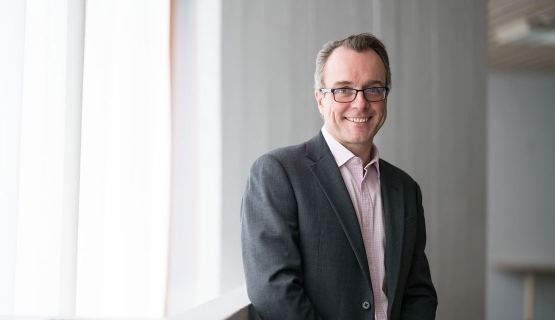 Julian Birkinshaw is Professor of Strategy and Entrepreneurship. To prove his point of a new world order, he has written down a list of top ten listed firms: Apple, Amazon, Google, Microsoft, Facebook, Alibaba, and so on. Successful companies are platform-based, mostly founder-led, digital products. What can they teach us? At least something about how to get organized, leadership, and adapting. “Why do established firms fail to adapt to the new world order?” Birkinshaw asks, and goes on to answer himself. He mentions risk aversion as one reason, backed by Sam Goldwyn’s much-quoted words: ”I don’t want any yes-men around me. I want everybody to tell me the truth even if it costs them their jobs.” Goldwyn (1879-1974) was a Polish-American film producer, whose face is now used to remind that to stay in tune with the times, there is no point playing things down. The structures of the industrial age still prevail in traditional organizations, even if they call for other types of leadership and organizational structures. Julian Birkinshaw describes the shifting emphasis over time by separating three different eras: the industrial age, the information age – and thirdly: the agile age. The industrial age places emphasis on productivity and efficiency. The information age is about rational analysis and expertise. The agile age highlights agility, intuition, and decisiveness. Adhocracy is a flexible, adaptable, and informal form of organization, and lacks formal structure. It is characterized by adaptive, creative, and flexible integrative behavior based on spontaneity. The lecture in Espoo is attended by supervisors ranging from the public sector to Google. Some of the participants can identify themselves as representing a bureaucratic organization in an agile age. What can a public sector leader learn from the organization models of a platform economy? Birkinshaw talks about autonomous teams from a somewhat different angle than those who emphasize how crucial freedom is in liberating people’s inner motivation. He describes the age of adhocracy as a time where “action is privileged over knowledge”. He thinks that to navigate the future, the ability to act with decision and purpose is more important than big data, knowledge, or all-seeing leaders with their budgets and strategies. “The internal world of companies should be as fast as the external world”, says Birkinshaw. Also the leaders of traditional companies need to learn from the agile movement, which has revolutionized software development. Birkinshaw compares adhocracy to a busy junction, which can seem chaotic to outsiders who do not know how to behave. “If you create a junction with the sole purpose of preventing all accidents, it will be really slow. You take away all the power and authority from individual movers, if preventing mistakes is all you are after. The other alternative is to let people figure out how the junction works for themselves, so traffic is speedy and smooth. This requires tolerating risk and even accidents.” A junction organized to the extreme aims for everything to happen formally. A junction that may seem chaotic has another type of aim: to get things done the people’s own way. Birkinshaw himself believes there should be a minimum number of rules, so people can do their work in their own way. This is of course different in a nuclear power plant than in a technology firm, but the principle is the same: no rules for rules’ sake. Professor Julian Birkinshaw is Professor of Strategy and Entrepreneurship; Academic Director of the Institute of Innovation and Entrepreneurship, Deputy Dean (Executive Education) at London Business School. BSc (University of Durham), PhD and MBA (Richard Ivey School of Business, Western University, Canada). Birkinshaw was ranked 46th in the 2017 Thinkers50 list of top global management thinkers. He is author of 15 books, including Fast/Forward, Becoming a Better Boss, Reinventing Management, and Giant Steps in Management, and has written more than 90 articles in journals. Professor Julian Birkinshaw from London Business School was lecturing at Aalto Executive Summit 2018. Read more about Aalto Executive Summit and degree programs.